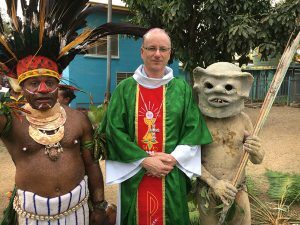 Bishop Charles welcomed by parishioners of Morata, Port Moresby. Port Moresby has never been on my Bucket List. But recently I had the opportunity to visit the capital of Papua New Guinea for the Annual Executive Committee Meeting of FCBCO (Federation of Catholic Bishops’ Conferences of Oceania). That’s a mouthful of titles. It comprises representatives from the four Bishops’ Conferences, or groupings of Bishops, from Oceania: New Zealand; Australia; Papua Guinea and Solomon Islands; and the rest of the Pacific Nations. Some might ask, what do we have in common? The Pacific’s island nation States are widely flung and the cultural differences large, yet our common faith unites us and what is of concern for humanity in one region often is of concern elsewhere too. Our annual gatherings unfold within the rhythm of prayer time and daily Mass. We also visit places and projects of local importance. This year Caritas College was in walking distance of our Salesian accommodation and there we met Korean Sisters running a vocational skills high school for local PNG girls complete with a very Korean martial-arts programme. None of us volunteered to join in. When we visited a cooking class, however, we became more participatory. 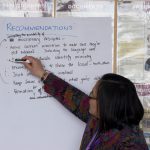 For particular consideration in Moresby were the following topics: civic governance, seabed mining, refugees and migrants, and the political situation of West Papua. 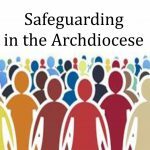 Concern for the social and political context in which we nurture family life is of great importance to all citizens and, as people of faith, our reflections draw on the rich treasure of the Church’s social teachings. 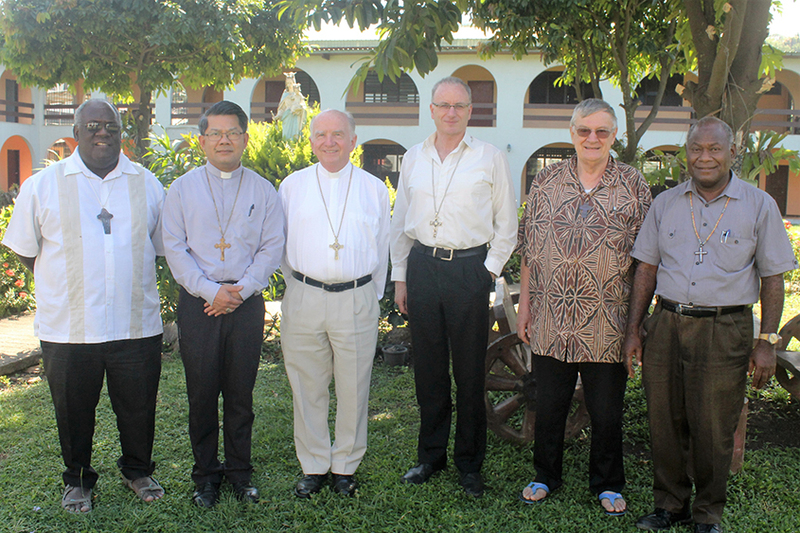 Pictured at the Papua New Guinea for the Annual Executive Committee Meeting of FCBCO are, from left: Bishop John Bosco Baremes SM (Vanuatu); Bishop Vincent Long OFM Conv (Australia); Bishop Robert McGuckin (Australia); Bishop Charles Drennan (Palmerston North); Archbishop Michel Calvet SM (Noumea); Archbishop John Ribat MSC (Port Moresby, Papua New Guinea). Sometimes it is when we are out of our usual social context that we find the space to reflect on it. So, while hearing stories in Moresby my mind frequently drifted back to New Zealand. Refugees is a live topic here. Migrant labour is too. Does it not disturb our assumptions about Kiwi culture and enforcement of the law when we learn almost daily of some farmers, orchardists, viticulturists and labour agencies blatantly underpaying migrant labourers? And what of the thousands and thousands of dollars that migrant families end up paying for legal fees, repeated medical reports and tests, visa fees, immigration consultancy fees (for what when Immigration NZ claims all criteria are transparent and fool proof? ), nursing council etc fees and so on, all paid from ‘savings’ out of the minimum wage after having paid rent and food? Welcome to Godzone NZ – yep or yeah right? Of course all is not doom and gloom. Good people are doing good things. We had an inspirational talk by the Governor of Port Moresby city who had been a human-rights lawyer. His story of cleaning up the city, and inspiring others – civil servants, police, community leaders, politicians etc – to lift their game was a heart-warming moment for us all. And here in New Zealand during the Year of Mercy I sense that our hearts have been emboldened with the desire to ensure justice is put to work in the social and economic context of our country where the vulnerable show their face. Bucket Lists have never been my thing. But I would happily return to Moresby. In fact in 2018 it will be the seat of our four-yearly plenary meeting, becoming host to all the Bishops of Oceania; some 80 in total. 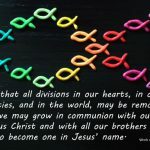 – Bishop Charles Drennan, September 2016.